We would like to publicly thank everyone that made the Michigan Irish Music Festival an incredible weekend for the Fiddlers. 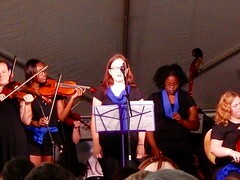 Thank you to the Michigan Irish Music Festival for again inviting the Fiddlers to perform at this incredible event. It’s an honor to be able to play at the same venue with such amazing musicians from around the world right here in Muskegon. Thank you to parents, families, friends, and Mona Shores Alumni that came out to support the Fiddlers. Playing to a full, friendly house was a blast! All the weekly rehearsals have paid off. Thank you to the very talented sound crew! It’s alway nice to perform when we have friendly and knowledgeable audio engineers! Over the weekend we shared many more pictures and videos of the MIMF on our Instagram and Facebook pages – too many to re-post here. We also shared that The Founding (formerly Blarney Castle) will be our special guest at the 16th Annual Fiddle Festival. More Fiddle Fest information coming soon. If you missed the Fiddlers this past weekend you can catch them this Friday, Sept 22, 2017, at the Mona Shores High School Homecoming Tailgate Party! Wishing safe travels, best of luck and congratulations to the Mona Shores Chamber Orchestra. Yesterday on their performances at the Michigan School Band and Orchestra District 7 Orchestra Festival at Grand Haven yesterday. They performed for a panel of four expert adjudicators who rated the groups in the five areas of Tone, Intonation, Rhythm, Interpretation, and Technique. The Concert Orchestra earned an Excellent rating. Scheduling worked out yesterday that after the required material for the MSBOA Orchestra Festival the adjudicators came in and gratiously gave a mini session as the Chamber Orchestra as was playing their remaining pieces for their National Orchestra Festival performance this weekend. The Chamber Orchestra is on their way now to National Orchestra Festival in Pittsburgh, Pennsylvania. 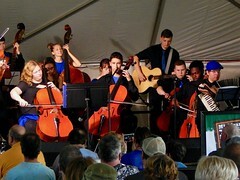 The festival is one of the many events that takes place during the American String Teachers Association’s National Conference. Fewer than thirty school orchestras from the entire country have been selected to participate this year. Our orchestra is very excited to receive this invitation to perform on a national stage!